﻿ Effective way to protect solar power photovoltaic system from lightning and surge - Technical Support - Fatech Electronic CO., LTD.
A damaging surge can occur from lightning and surge that strikes a long distance from the system, or even between clouds. Lightning and surge is a common cause of failures in photovoltaic (PV) and wind-electric systems. But most lightning and surge damage is preventable. Here are some of the most cost-effective techniques that are generally accepted by power system installers, based on decades of experience. Follow this advice, and you have a very good chance of avoiding lightning and surge damage to your renewable energy (RE) photovoltaic system. Surge arresters are designed to absorb voltage spikes caused by electrical storms (or out-of-spec utility power), and effectively allow the surge to bypass power wiring and your equipment. surge protectors should be installed at both ends of any long wire run that is connected to any part of your system, including AC lines from an inverter. surge protection device(SPD)are made for various voltages for both AC and DC. Be sure to use the appropriate surge arresters for your application. “Lightning rods” are static discharge devices that are placed above buildings and solar-electric arrays, and connected to ground. They are meant to prevent the buildup of static charge and eventual ionization of the surrounding atmosphere. They can help prevent a strike, and can provide a path for very high current to ground if a strike does occur. Modern devices are spike-shaped, often with multiple points. Lighting rods are typically only used at sites that experience extreme electrical storms. If you think your site falls into this category, hire a contractor who has experience in lightning protection. If your system installer is not so qualified, consider consulting with a lightning protection specialist before the system is installed. Class I Lightning arresters, Class II surge arresters and Class III surge protectors are designed to protect electronic equipment by absorbing electrical surges. However, these devices are not a substitute for good grounding. They function only in conjunction with effective grounding. Grounding is the most fundamental technique for protection against lightning and surge damage. You can’t stop a lightning surge, but you can give it a direct path to ground that bypasses your valuable equipment, and safely discharges the surge into the earth. An electrical path to ground will constantly discharge static electricity that accumulates in an aboveground structure. Often, this prevents the attraction of lightning in the first place. The weakest aspect of many installations is the connection to the earth itself, you must bury or hammer a rod of conductive, noncorrosive metal (generally copper) into the ground, and make sure most of its surface area contacts conductive (that means moist) soil. This way, when static electricity or a surge comes down the line, the electrons can drain into the ground with minimal resistance. In a similar way to how a drain field dissipates water, grounding acts to dissipate electrons. If a drainpipe doesn’t discharge adequately into the ground, backups occur. When electrons back up, they jump the gap (forming an electrical arc) to your power wiring, through your equipment, and only then to ground. To prevent what mentioned above, to install one or more 8-foot-long (2.4 m), 5/8-inch (16 mm) copper-plated ground rods, preferably in moist earth. A single rod is usually not sufficient, especially in dry ground. In areas where the ground gets extremely dry, install several rods, spacing them at least 6 feet (3 m) apart and connecting them together with bare copper wire, buried. An alternate approach is to bury #6 (13 mm2), double #8 (8 mm2), or larger bare copper wire in a trench at least 100 feet (30 m) long. (The bare copper ground wire also can be run along the bottom of a trench that carries water or sewer pipes, or other electrical wires.) Or, cut the ground wire in half and spread it in two directions. Connect one end of each buried wire to the grounding system. Try to route part of the system into wetter areas, like where a roof drains or where plants are to be watered. If there is steel well-casing nearby, you can use it as a ground rod (make a strong, bolted connection to the casing). In moist climates, the concrete footers of a ground- or pole-mounted array, or a wind generator tower, or ground rods encased in concrete will not provide ideal grounding. In these locations, concrete will typically be less conductive than the moist soil surrounding the footings. If this is the case, install a ground rod in earth next to the concrete at the base of an array, or at the base of your wind generator tower and at each guy wire anchor, then connect them all together with bare, buried wire. For building wiring, it requires one side of a DC power system to be connected—or “bonded”—to ground. 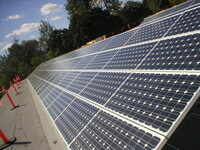 The AC portion of such a system must also be grounded in the conventional manner of any grid-connected system. It is essential that the DC negative and the AC neutral are bonded to ground at only one point in their respective systems and both to the same point in the grounding system. This is done at the central power panel. Producers of some single-purpose, stand-alone systems (like solar water pumps and radio repeaters) recommend not grounding the power circuit. Refer to the manufacturer’s instructions for specific recommendations. Array wiring should use minimum lengths of wire, tucked into the metal framework. Positive and negative wires should be of equal length, and be run together whenever possible. This will minimize induction of excessive voltage between the conductors. Metal conduit (grounded) also adds a layer of protection. Bury long outdoor wire runs instead of running them overhead. A wire run of 100 feet(30 m) or more is like an antenna—it will receive surges even from lightning in the clouds. Similar surges can still occur even if the wires are buried, but most installers agree that buried transmission wiring further limits the possibility of lightning damage. A simple strategy to reduce susceptibility to surges is the “twisted pair” technique, which helps equalize and cancel out any induced voltages between the two or more conductors. It can be difficult to find suitable power cable that is already twisted, so here’s what to do: Lay out a pair of power wires along the ground. Insert a stick between the wires, and twist them together. Every 30 feet (10 m), alternate the direction. (This is much easier than trying to twist the whole distance in one direction.) A power drill can sometimes be used to twist wiring as well, depending on the wire size. Just secure the ends of the wiring into the drill’s chuck and let the drill’s action twist the cables together. Make sure to run the drill at the lowest possible speed if you try this technique. The ground wire need not be twisted with the power wires. For burial runs, use bare copper wire; if you use conduit, run the ground wire outside the conduit. The additional earth contact will improve the grounding of the system. Use twisted-pair cable for any communication or control cables (for example, a float-switch cable for full-tank shutoff of a solar water pump). 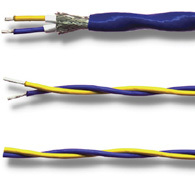 This smaller gauge wire is readily available in pre-twisted, multiple, or single pair cables. You also can purchase shielded twisted-pair cable, which has a metallic foil surrounding the twisted wires, and typically a separate, bare “drain” wire as well. Ground the cable shield and drain wire at one end only, to eliminate the possibility of creating a ground loop (less direct path to ground) in the wiring. Previous: What is surge protection device protection mode?